In the 1920s, the Brown Hotel hosted over a thousand guests each evening for its dinner dance. Guests would dance well into the wee hours of the morning before heading over to the restaurant for a late-night bite. Chef Fred Schmidt set out to create something new for these guests, and so he created a unique open-faced turkey sandwich with bacon and a delicate Mornay sauce. 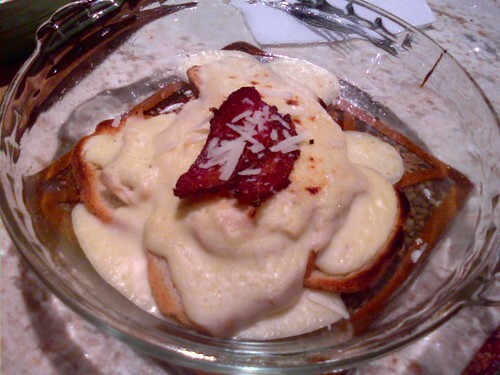 Thus, the Hot Brown was born! The Hot Brown is definitely a local delicacy of the Louisville area, and I have enjoyed it there while visiting my best friend from high school, who is a middle-school teacher there, and when I used to go visit my brother, who attended grad school in Louisville. But I have also seen it in other restaurants, such as Martin’s Tavern in the Georgetown neighborhood of Washington, DC. 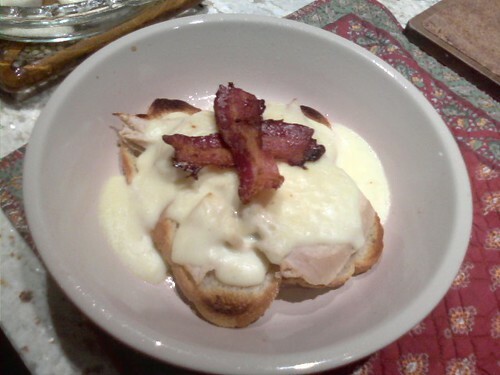 So with our leftover roasted turkey, I decided to try my hand at the original recipe for the Legendary Hot Brown. Heat a medium saucepan over medium-low heat. Melt butter and add enough flour to absorb the butter into a thick sauce. Stirring constantly, cook the mixture for 2-3 minutes. This process cooks the flour so that your sauce doesn’t taste starchy. Slowly add the milk and Parmesan cheese, whisking the mixture to keep it smooth. Add the beaten egg to the mixture, whisking constantly. Turn the heat down to low and allow the mixture to heat and thicken, but don’t allow it to reach a boil. Stirring constantly, continue to cook the mixture for about 8-10 minutes. You will know when it’s ready because it will become the consistency of thin pudding. Remove the sauce from the heat and add salt and pepper to taste. Preheat your oven to broil. Spray a small cooking dish or pie plate for each hot brown with cooking spray. 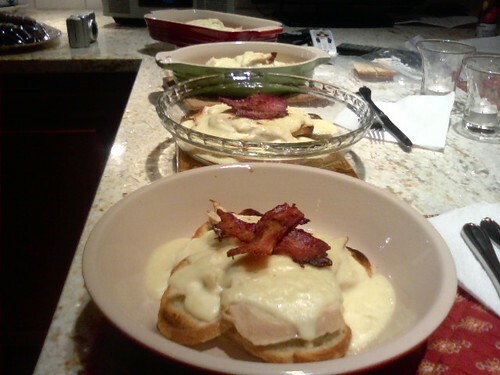 For each Hot Brown, place two slices of toast in the bottom of each dish. Next, layer as much turkey as you would like on top of the toast. Finally, pour a generous amount of sauce over the turkey and toast. Place each dish under a broiler until the sauce is speckled brown and bubbly. Remove from broiler, cross two pieces of bacon on top, and sprinkle with additional Parmesan cheese. Serve immediately. Makes 4-6 servings. PS: Sorry for the lackluster photos – I had to use my camera phone for this one!